Two years ago I made a Christmas in New York post for the Julekalender and it still brings me so much joy looking back through it. Now I think it is time to do a post about Christmas in Copenhagen, seeing as this is where "home for the holidays" is for me now. Next year I'll make sure to do Aarhus, but Copenhagen is Denmark's New York so I thought it was a fitting post :) If you want to read the Christmas in New York post you can either click through or find it under December 20th of the Julekalender. Now respectfully, Copenhagen isn't exactly New York, but is there really any city like New York with the energy, the lights, the store windows and yellow cabs? I mean, I think anything can truly compete with Rockefeller Center. With that being said though, Copenhagen is what comes closest here in little Denmark and I still think it does a pretty damn good job. Denmark is the center for hygge, so really the whole country knows how to Julehygge (Christmas-hygge). Side note: if you haven't read The Little Book of Hygge then you need to. It's perfect all year round but it just seems even more hyggeligt during the holiday season. I read a couple of chapters every night before bed and it's truly the best way to wind down! Ok back to Copenhagen, this time of years hygge capital. 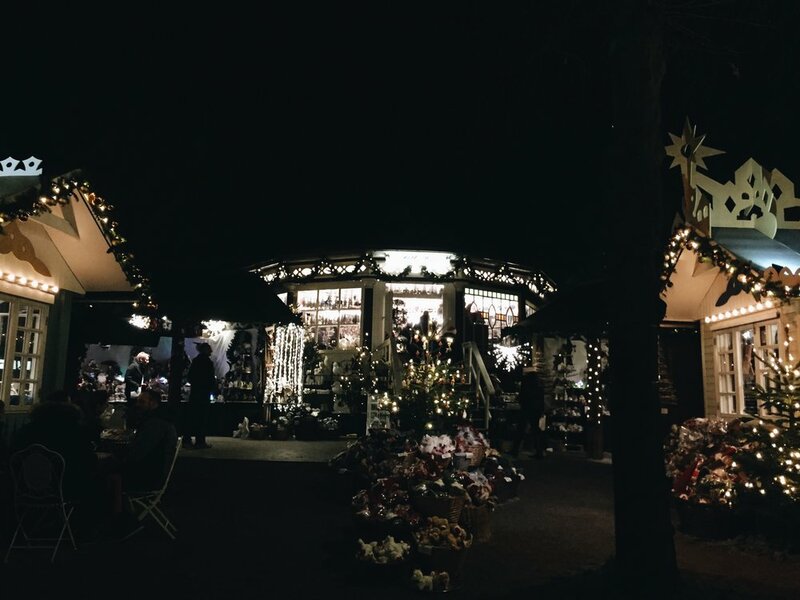 Whether it's the little Christmas markets scattered across the city or the lights or the music or even the hustle bustle of everyone biking to and from their Christmas shopping. It's truly a festive sight to see someone come biking by with beautifully wrapped Christmas presents in their baskets. I think it really is the hygge element that makes all of Denmark, not just Copenhagen, so crazy cute and cozy during this time of year. Most apartments and houses have lights either in their windows (which is adorable) or on their little terraces. Some go all in and some are a little more mellow - both are beautiful and Christmasy in their own special way. 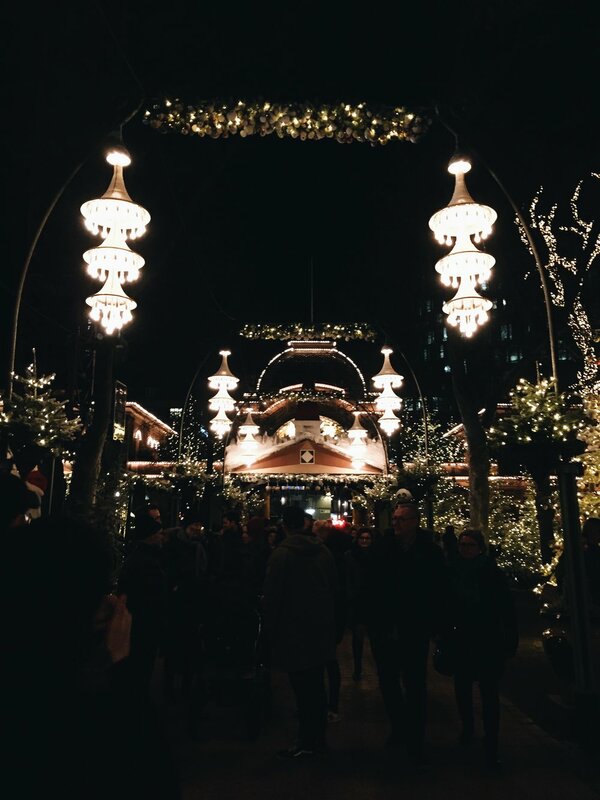 One thing in Copenhagen that is special during this time of year is Tivoli. Tivoli is probably the somewhat equivalent to Rockefeller Center. Not at all the same thing but the fact that they are both such big symbols of each cities Christmas makes them equivalents, at least in my mind. Tivoli is a small amusement park right in the center of Copenhagen, right next to the Central Station. Tivoli is cute all year round but during Christmas they go all in! There's snow, gløgg and æbelskiver booths, Christmas trees and lots and lots of lights. It's really worth going at night - actually it's a must see at night! 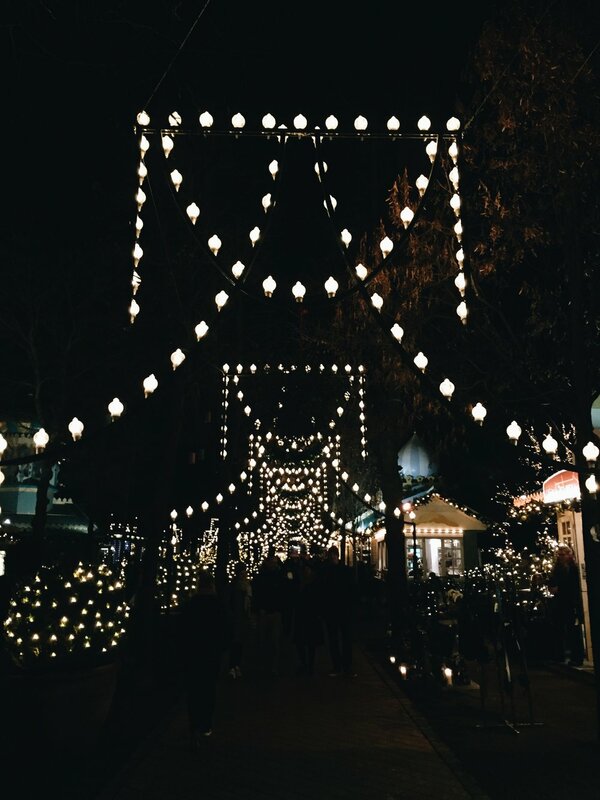 Visiting Tivoli truly just gets you into the Christmas spirit. Definitely a must see if you are here during the holidays. It's a new little Christmas tradition we have incorporated into our lives since I moved to Denmark two and half years ago and the rest of my family one and half years ago! So many amazing Christmas traditions have been continued and started over my 21 years on this planet and I love each and every one of them! To read more about some of my Christmas traditions and look into a Danish Christmas, you can take a peak at my Christmas Calendar! So this is my little sneak peak into Christmas in Copenhagen! I would love to hear about your Christmas traditions or your favorite places during the holidays, so comment below if you have something you want to share!